So it has now been a few weeks, I suppose, since I went backpacking with my brother Shane in Sequoia. But if it is any indication of how hectic my life has been recently, I am just sitting down to write the post about it. The long and the short of the trip was that since we took our parents van we couldn’t make it to Mineral King, a very steep and remote part of the park. However, there were still some trails that lead off from Giant Forest that we had yet to do. Specifically, The High Sierra Trail. The High Sierra Trail has a pretty interesting history itself. It is essentially a quite long, well established cut-off trails. It was meant as a quick way to give access to longer and more imposing back country romps like the Pacific Crest Trail and the John Muir Trail. Starting from Crescent Meadow in Giant Forest, the High Sierra Trail takes you 60 miles up and down to the peak of Mt. Whitney (the highest peak in the continental US). That is not what we did. Hiking clear east across the park and up Mt. Whitney was not the plan this time out. However, we did end up walking a couple of days down this way and used the High Sierra Trail to cross the Great Western Divide the first time. But the really strange thing about the High Sierra Trail was that it was both very busy. And in spite of this traffic, everyone on it was a little off, if not downright nuts. 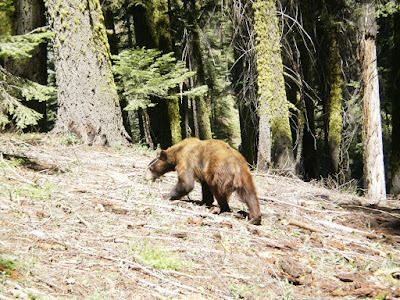 Day 1: We pretty much walk into this bear on our first mile out. I have been close to bears before but never like that. Shane is the one who has to tell me that there was a bear ten feet in front of me on the trail, if only I would bother to look up. We stand there and look at each other, us and the bear, for a moment. Shane and I make ourselves big, wait, and then take a step towards it. The bear scuttles off. It was pretty comical. It did not take us long for us to meet a certain older couple for the first time. She was lithe and ladylike. He had a classic seventies ‘stash. We nick named them the ‘Tortoises’ to our ‘Hares’. We would pass them, take an extended break. They would chug along and pass us. We would sleep in, only to find them ahead of us on the trail again! This scenario played out five times in various ways over the course of two days. When we made it to Bearpaw Meadow, the family in the camp next to us strongly hinted that we were not welcome there. Not wanting to be part of any club that had such jerks as members, we took the easy road and left. And now I am tired in real life…I’ll try getting the rest out soon!